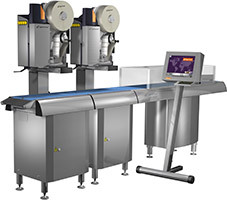 The fully automatic high-speed price labelling system is optimally adapted to the production requirements thanks to its modular and flexible design. It convinces through an outstanding performance with a maximum speed of up to 150 packs per minute and a simple and quick task management. All high-speed systems can be modularly combined with up to 5 printers from the top or from the bottom.